So am I correct that the back cut I keep reading about is not the definitive way to decide if a M7 is a military contract or commercial produced bayonet? And if there is there a way, how would you decide if you were looking for a military issue production M7? I noticed that there are small nuts versus the threaded hand guard. Is this a military or commercial feature? My Imperial/colt came with two 11010068 grips with two separate small black nuts. Edited by PaulS, 19 March 2018 - 06:57 PM. The back cut, in and of itself, is not a good indicator of whether an M7 is US military, foreign aid, or commercial. However, if you have a BOC, Conetta, or FZR; they will always have 90° back cuts and are all US contracts. (you've already found out what happens when I use the word "always") Milpar US military contracts will have a 90° back cut and those are always considered US military, but they made thousands of curved run out blades that are not supposed to be US contract M7s. If you have an Imperial M7 (not Colt), the 1973 contract will have a 90° back cut, but the the military began to allow the curved run outs after that, so the later 1976 and beyond contracts will have curved run outs, and are US contract, but you cannot be sure. Imperial made bayonets for other countries as well. Ontario and General Cutlery will have the curved run outs and were produced for US contracts as well as commercial and foreign customers. You cannot tell the difference unless there is a welded cross guard (remove the grips), then you know for sure they are commercial. The grips held together by screws and nuts are found on the Imperial/Colts. They are also found on Eickhorn produced M7s. The rest of the M7s use the " threaded bushings" glued into the grips. So if you want to be sure you are getting a real US military M7 bayonet, find one of the US contractors: Milpar, Conetta, BOC, FZR, and Imperial with a 90° back cut. To help with the timeline, other than the Eickhorn made Colt M7s, all the other Colt marked M7s pre-date the aforementioned contractors. Hope this helps. my newly arrived Milpar M7. Looks like it was sharpened at one time. What do you think? Original GI contracted bayonet? Yes it does. It may have gone through a "repair and refurbish" arsenal overhaul (maybe by a foreign country). An untouched M7 will have a white line of sharpening having been sharpened after being parkerized. Thank you Marv for your repeated helpful responses. oh, One last photo of this bayonet. Edited by PaulS, 22 March 2018 - 06:35 PM. Below are photos of two Milpar 1st contract M7s. Bayonet on top is a Milpar/Colt and on bottom is a standard contract Milpar. Note that both bayonets have the sharpened edge parkerized as opposed to all other manufacturers who sharpened theirs after Parkerizing. As far as can be determined Milpar was the only one to do this and only on 1st contact pieces with the chevron pommel. Edited by remman, 23 March 2018 - 11:40 AM. Awesome examples! Thank you remman. Found another first contract Milpar M7 with a straight back cut. It has a slotted tang as I believe they are supposed to and came with a "WD" M8A1 scabbard with a "100" rack number. The grip screws may have been replaced at one time as there were no washers but there were indentations in the grips were washers once sat. The screw heads also have straight sides compared to other M7 grip screw heads which are rounded. Were there different styles of screws used? the threading seams correct and are not stripped. What do you think? Edited by PaulS, 24 April 2018 - 06:20 PM. Found another first contract Milpar M7 with a straight back cut. It has a slotted tang as I believe they are supposed to and came with a "WD" M8A1 scabbard with a "100" rack number. The grip screws may have been replaced at one time as there were no washers but there were indentations in the grips were washers once sat. The screw heads also have straight sides compared to other M7 grip screw heads which are rounded. Were there different styles of screws used? the threading seams correct and are not stripped. What do you think? The pics are above this post. Edited by PaulS, 24 April 2018 - 06:24 PM. I have a comparable Milpar M7. It comes from a military source. There are more of these pieces. Reading the forum above i notice that it is stated that the M7 Ontario has a curved back cut / run out like the Gen Cut. My Ontario has the near 90 deg. back cut, it is in its black Ontario M10 scabbard with a black leg tie and i believe that it is all correct. All of the Ontario M7's i have seen have the similar near 90 deg back cut to mine. My M7 Gen Cut has the curved back cut the same as the Milpar photo's above. Question is, does the Ontario have a near square back cut or a curved back cut, or are there both. When Ontario's M7 contracts started the Government requirement for the radius back cut was already in place. IMHO, the Ontario's with the near 90˚ back cut started appearing after the U.S. Government started ordering M9 bayonets, just haven't found more than opinions yet to back that up. Milpar stopped making knives and bayonets before the Government requirement changed to a radius back cut. The radius blades I've seen on M7's with MILPAR marked guards look different than early known Milpar blades in other ways than just the back cut. Any idea of how many Ontario M7's were made with the curved back cut, i have found it hard to even find a photo of one, but the square back cut ones appear everywhere. My Milpar M7 with 90* back cut has the bevel edge to the back of the blade, the chevron on the pommel and slotted tang. The Milpar M7 shown above with the curved back cut does have the slotted tang tho but everything else looks different, any idea of its vintage. I only know Ontario M7´s with a near 90˚ back cut. Gen Cut produced M7 bayonets with curved and 90˚ back cuts. Edited by Windraider, 31 December 2018 - 09:15 AM. I have seen the Gen Cut with both back cuts on the Humes' Gen Cut page but have never seen a square back cut one for sale. Still a little confused about the Ontario back cuts tho. 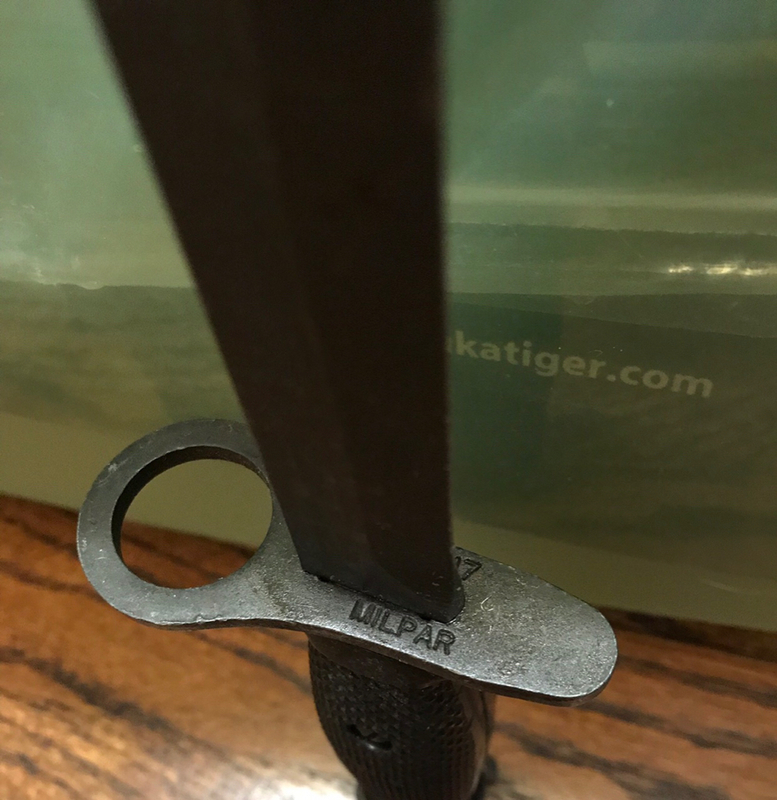 I just picked up this Milpar M7 with PWH scabbard. Would this bayonet be appropriate for a US Army Vietnam display circa 1967? yes. MILPAR M7 were in use since 1964/65. I don't know if the controversy over Milpar marked M7's with radius backcut blades is settled one way or the other. One of the things that tends to bother some collectors is that at least many of these radius back cut blades don't show any of the tell tale signs left on earlier Milpar blades which trace back to different processes that Milpar patented and used. That combined with a story that Milpar sold off their over stock of parts to a large surplus company who assembled and sold them commercially as finished blades. Some believe these blades are not used in Government contract bayonets. I have an example of one of these Milpar's and as of now I don't know for sure what it maybe so I keep it with my curiosity knives for the time being.